Updating Windows 10 regularly is important. Regular updates, issued on Patch Tuesday contain bug fixes and security updates. That’s why Windows updates itself automatically, and you can’t turn those automatic updates off. That doesn’t mean you can’t control Windows 10 automatic updates, however. 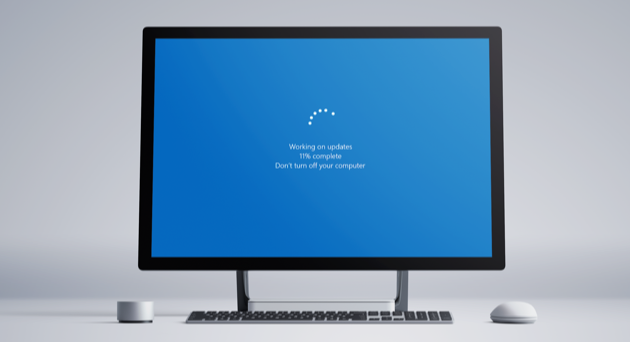 One reason you might want to take more control of updates is that you’re worried that you don’t have enough space for a major upcoming update – Microsoft launches to major upgrades to Windows 10 each year, the installers tend to be around 3GB in size and extract to a file of 7-8GB – you can use Disk CleanUp to free up space. Right-click on your C: drive in File Explorer and choose Properties, then Disk Cleanup. Windows will then delete any temporary files that are still hanging around, as well as Recycle Bin files and ay other data that’s no longer needed. If an update has already started and you get a warning that you don’t have enough space to complete it, you’ll need to delete files manually. You can also use a PC cleaning app, like CleanMyPC, to get rid of junk files, uninstall apps, and generally clean up your disk and create more space. CleanMyPC is very easy to use and has several tools that can claim back disk space and help your PC run more smoothly. It’s as easy as downloading and installing it, pressing the Scan button, and then if you’re happy to delete everything it recommends, there’s only one more button press and you’ll have several gigabytes more free space. How do I control Windows 10 updates? Remember when you first installed Windows 10 and had to answer a number of questions to adjust various settings? One of the questions related to how you wanted updates to be installed. The choices offered were to have Windows 10 (along with other Microsoft programs) updated completely automatically or to have a little more manual control over how and when updates take place. Fully automatic updates make sure that Windows 10 is always up to date and that it’s as secure as it can be. However, they can also cause problems, getting in the way when you have important work to do or slowing down your PC so much that you can barely use it. More manual control allows you to prevent updates getting in the way of your work, but run a greater risk of not always being up to date. It’s a trade off and one you need to decide on for yourself. Automatic — This option automatically downloads all updates, security and non-security and is the safest option to choose to update Windows 10. Notify to schedule restart — Normally when you select automatic upgrades, Windows will restart your PC, if the update requires a restart, whether you want it to or not. If you choose this option, you can delay the restart and choose a time for it to take place and the installation to complete. Make sure you choose a time when you know your PC will be running. Updates that don’t require a restart will download and install normally. Give me updates for other Microsoft products when I update Windows — this allows you to choose to update other Microsoft applications, such as Office 365, when you update the operating system. Defer upgrades – This option doesn’t apply to critical security updates, which are installed automatically regardless of your selections. However, it allows you to defer non-security upgrades for up to several months. If you’re really fed up with updates interrupting your work, it may be a good option. However, it’s easy to forget to run the updates and so you may want to set reminders for yourself if you choose this option. Delivery Optimization (also called Choose how updates are delivered in earlier versions of Windows 10) — Windows 10 delivery optimization is designed to speed up the update process by allowing you to download updates from other PCs on your local network or from elsewhere on the internet. It also allows your computer to be used to supply update files to others. If you don’t want to participate in this program, select Delivery Optimization and set Allow downloads from other PCs to off. There is no way to choose a setting that prevents updates being downloaded. However, there is a trick you can use to change the way Microsoft offers updates — tell it that your internet connection is metered and that you have a limit on the amount of data you can download each month. Microsoft isn’t too clear on the effect this has on updates, saying only that ‘some updates for Windows won't be installed automatically’ and so we have to assume that critical security updates will still be installed. Nevertheless, it’s an option. Taking control of Windows updates isn’t difficult. Microsoft would rather you err on the side of safety and install them automatically as soon as they become available. And that’s certainly the best course of action if you want to make sure you’re always running the latest version of Windows. But if you get frustrated by updates getting in the way of you using your PC, follow the steps above and take charge of updates.